The RocketLinx ES7510 switch has been discontinued and replaced by the RocketLinx ES7510-XT. The RocketLinx ES7510 product pages will be maintained to provide product and support information. 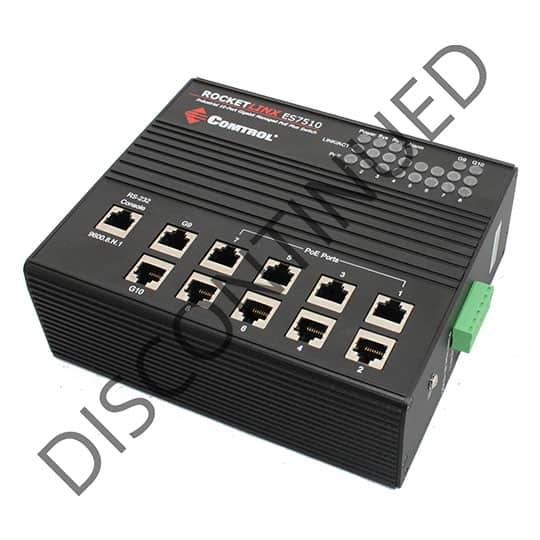 The Comtrol RocketLinx ES7510 managed industrial PoE Plus switch is designed to meet the high power and advanced management needs of critical PoE applications such as real-time IP video surveillance and wireless communication utilizing Wimax and IEEE 802.11 a/b/g/n access points. Featuring a rugged design for harsh environments, intuitive web, CLI, SNMP management options, power scheduling and eight fully compliant IEEE 802.3at PoE injector ports, the ES7510 is easily configured to deliver up to 30W for even the most power intensive devices such as IP cameras utilizing heaters and pan/tilt/zoom controls. In addition to functioning as a PoE power source, the ES7510 includes features to enhance control of devices, ensuring that power consumption does not exceed parameters defined by the user. This includes power budget control functions to limit power output on devices not reporting correct consumption rates and device priority options to guarantee power to critical devices while avoiding power supply overloads. The RocketLinx ES7510 is equipped with full Layer 2+ management capabilities to provide the most flexible network configuration and control. Features like Link Aggregation Control Protocol allow grouping of multiple ports to enhance bandwidth and provide load balancing while Port-Based VLAN, QOS, IGMP Snooping, and Rate Control features enable optimum control over the network environment. In addition to the full array of management capabilities, the ES7510 also supports the most advanced security features to protect the network and guarantee secure, reliable data transmission. Fault relay and e-mail notification of event alarms, DHCP supporting IP and MAC binding, IEEE 802.1X Access Control, SSH, and many other controls are included to make secure administration and management a simple task. Dimensions 7.3" x 2.6" x 6.25"
RocketLinx® ES7510 User Guide Contains detailed installation procedures and configuration information. RocketLinx® ES7510 Quick Install Guide Quick guide to installation and configuration information.